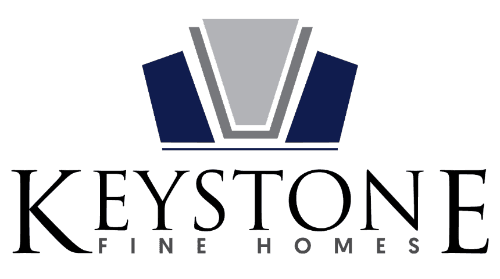 At Keystone Fine Homes we have laid out a step-by-step plan, that will take each customer from the first construction phase to the final inspection where they are given the keys to their new home. For each phase of construction there is at least one quality checkpoint that must be passed in order to move on to the next phase. Below is a description of our step-by-step plan. At the preconstruction meeting, you are invited to sit down with your sales person and superintendent for a final review of your home plans and specs. Together, you'll verify the placement of the house, review the blueprints, and find out what to expect during the building process. When city permits are cleared, construction can begin. Final selection on brick, stone and window color and style. The first step to building a quality home is laying the foundation. Keystone Fine Homes checks soil conditions, and home size to ensure that a quality structural system is built for your home. Before construction begins, the foundation is checked for proper squareness and size. Final selections on all options and colors. The walls start going up on the first day of frame start. Once the joists and rafters are in place, the entire roof is installed. After framing is complete we will review the electrical and cabinet plans. During this one-to-three week phase, air conditioning, heating, plumbing and electrical wiring are installed. HVAC (heating, ventilation, air conditioning) and plumbing systems are “roughed-in”. The installation of phone, cable and other electrical systems occur simultaneously. Drywall is stocked in the home while insulation, gas meters and permanent power connections are installed. It frequently takes two full days to hang interior drywall. Next, drywall taping and finishing are scheduled. After the interior walls are touched up, the walls and ceiling are textured. There are two drywall checkpoints. One before drywall begins and one after its completion: Upon cleaning up any drywall debris, all walls and ceilings are checked for finish and consistency. Now the fun really starts. All the browsing you did is starting to pay off. During this two-week phase, you will begin to recognize the home you designed and imagine the future you'll create. Interior trim, cabinets, counters and sinks are installed. Walls and trim are painted and stained. Any necessary grading occurs outside (weather permitting) as hardware fixtures and carpeting are installed. Garage cleaning and paint touch-ups take place.